As you may well know, I've been both critical and praising toward blockchain-based social media. In particular, there are two platforms I am very excited about - Steemit and Narrative. Should you be on Narrative? If so, what should you be doing right now? The above subtitle was chosen carefully. I could compare Narrative to other blockchain-based social media, which I've done, or I could compare it to tier 2- or tier 3-level non-blockchain-based social media websites such as Instagram or Tumblr. I'm going after #Facebook for two reasons. First, because it's the leader of the pack. The bulk of the human race uses it at least some of the time. The second reason I want to compare Narrative to Facebook is because Narrative, with its design features, seems to be the blockchain-based social media site most poised to attract the average Facebook user--if those users can be convinced that blockchain-based social media has any value for them. That's a big if. But let's assume that it can happen. What is it about Narrative that would attract the average Facebook user? I will attempt to answer that question in the following bullet points. Personal Journal vs. Timeline - The most basic structural component to Facebook is the personal Timeline. It used to be called a Wall, but in 2011, Facebook announced its new Timeline feature, which effectively killed the Wall. Facebook has since become a repository of people's boring life events, cat memes, and personal updates on their political leanings (which remain relatively unchanged throughout the Timeline). Narrative offers a personal journal, essentially a blog, that allows people to pretty much post anything you'd see them post on their Facebook Timeline. Facebook sells advertising and earns revenue using targeted advertising on user Timelines without compensating users for creating the content that attracts those advertisers. Narrative allows users to earn from the content they post and be paid in the platform's native token or in U.S. dollars, if preferred. Groups vs. Niches - Facebook offers Groups, public or private meeting places for users who share a common interest. At last count, there were millions of them. Narrative, on the other hand, offers Niches. While they effectively provide the same benefits to end users, there is a vast difference in the structure. On Facebook, to post in a Group, you have to join the Group and post your message in the Group forum space. On Narrative, you can post to your personal journal and tag a Niche without ever joining that Niche. Like Facebook Groups, Niche moderators approve content and manage users, even banning those that cause trouble. Facebook offers no compensation to moderators for the time they spend moderating Groups, but Narrative does compensate Niche moderators. Narrative also allows users to buy a Niche, which provides the purchaser a one-year lease on the Niche and the ability to earn compensation based on that ownership. Pages vs. Publications - On Facebook, individuals and businesses can start Pages, which allow them to post to subscribers and followers of those Pages. However, not all subscribers and followers will see the posts. If you want your Page content to reach a wider audience, you have to pay to promote it. Narrative allows users to create Publications. With three levels of Publication (Basic, Business, and Enterprise), Publications must be purchased ($99 for the Basic level Publication is a pretty cheap way to start a business), and the Publication ownership can be renewed from year to year. While Publications do not earn rewards the same as Niches do, Publication owners may opt in or out of Narrative's Content Rewards program, in which case rewards earned by content creators that post in those Publications is shared with the Publication owner. I suspect, however, that Narrative will later add an additional revenue model for Publication owners that allow them to earn from advertising. What does all of this mean for Facebook users? Effectively, it means you can do a lot of things you are currently doing on Facebook on Narrative. There may be some structural differences, and definitely some platform culture differences, but much of what Facebook users are already used to can be seen in the basic Narrative format. The biggest difference is that Narrative has a compensation scheme for content creators while Facebook does not. There is another difference, too. Facebook shares user data with advertisers. Narrative does not. In fact, at present, there is no advertising model within the Narrative platform. That may come later, but I suspect that if it does, it will include a compensation scheme for content creators and may even include an opt in/opt out choice. This part of the discussion is for those who are currently on Narrative, those who have signed up for Narrative but aren't currently active, or those who may be thinking of joining the platform but haven't made up their minds. In my last post on Narrative, I shared some negative perceptions by some new users, and myself, after limited exposure to the platform. I have since spent more time on Narrative and have developed some new perceptions based on my latest interactions. Most of them are positive and I'll share those below (again, in bullet points). Alpha phase - Every technology startup goes through an initial phase where early adopters and users get in and test the platform to help developers work out the bugs. It's expected that there will be bugs. Early users are asked to help identify them so developers can fix them before the gold rush begins. Narrative is near the end of its alpha phase. Beta phase - Alpha phases are typically short. Beta phases can go on for years. In this phase, the friends of alpha users, and their friends, show up to see what the early adopters have been so excited about. Narrative is expected to enter its beta phase next month -- March 2019. Because Narrative is entering beta in March, users who jump on the platform right now have a unique opportunity to become the power brokers of the future. If you look at Steemit, the second wave of whales have finally come into their own (the initial whales were the founders and their friends and family who launched the platform in 2016). Many of the whales who are currently developing their own initiatives joined in the second wave, the early beta phase (and, by the way, Steemit is still in beta). Let's take a look at a few more unique Narrative structural features. The Tribunal - The Tribunal is the governing body of Narrative (it is not decentralized). Currently, The Tribunal is made up of Narrative founders. However, in September 2019, the platform will hold its first Tribunal election from among its users. To get on The Tribunal, a person has to be nominated (you can nominate yourself), have a high reputation (I'll discuss this shortly), and be KYC-verified. To participate in Tribunal elections, users must not have a low reputation score. An added layer of bureaucracy includes what is called The Committee. The Committee will consist of 5 Tribunal members and 5 employees of Narrative. It's unclear what The Committee will do exactly. Conduct - By any measure, conduct on Narrative is punitive. "By default, all members are Conduct Neutral," it says in the Narrative Spec. All actions on the platform are judged as either Neutral or Negative. Obviously, the Negative will count against you on your Reputation score. There is nothing in the Spec that says what actions are considered negative, but there is a complicated mathematical formula that shows how Negative conduct ratings decay over time. We can throw a party over that. Quality - The Narrative quality analysis is based on content the user posts, his or her followers, comments on content, and actions on the platform. Receiving likes by high-reputation users counts more on the quality analysis than receiving likes from low-reputation users. Another interesting aspect of this is if a user suggests a Niche that is not approved by the community, that counts as a negative toward the user's quality score and will hurt their reputation. Certification - To get certified simply means that you produce documents that prove you're human and a citizen of a country somewhere. You get 100 reputation points for doing this. Presently, there's not much a person can do on Narrative. 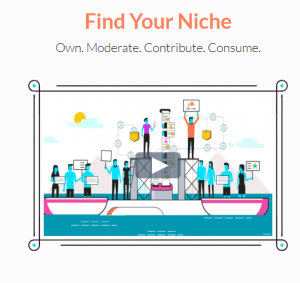 You can suggest Niches, vote on Niche suggestions, comment on Niche suggestions, bid on Niches at auction, buy Niches if you win the bid, nominate yourself or someone else for moderator positions of active Niches, and write content to your personal journal that will not go live until beta launch. If you take a look at this list, its pretty obvious what you may or may not earn a reputation score on. To be sure, early users should be working on improving their reputation scores. Be on your best behavior. The last thing you want is to acquire negative conduct points because you pugnaciously attacked the small community of active users testing the platform in its earliest stage. Therefore, enter with an open mind and try to learn the ins and outs of the platform without being judgmental of its structure and culture. These will likely change (we can hope) over time, and if they don't, well, then you'll have to decide if Narrative is for you or not. But if you go in with guns a-blazing, you can bet you'll get off on the wrong foot. After playing around on Narrative for a week, I've discovered that there are a handful of people whose focus right now is on suggesting Niches. Narrative allows users to suggest one Niche per day. Since that is the limit, the most active users are suggesting one Niche per day. And the ones who are doing this every day are increasing their reputation scores. I went from a 3 to a 7 in one week just by doing this and commenting on Niche suggestions. Nothing else. While you can create posts for your personal journal, those posts won't go live until beta launch. Therefore, no one will interact with them until then, and you won't earn any reputation points for writing them until they go live in March. I'm not saying don't do this (you actually should), just be aware that you will not see immediate benefits. A high-reputation score, one that qualifies you to be nominated for The Tribunal, is 85. If you get certified, you'll get 100 reputation points. However, that's not possible yet because that feature hasn't been activated on the platform. But it's also worth only 20% of your total reputation score, so I doubt that getting certified is going to be enough for anyone to actually earn a high reputation score. You'll have to produce content and be a good Narrative citizen. Simple Rep - A reflection of all your actions, "positive and negative." (It should say "neutral" and negative.) This accounts for 40% of your total score. That's a big deal. Quality Analysis - 40% of your total Reputation Score. Getting Certified - 20% of your score. You can see my personal breakdown below based on suggesting one Niche a day for the past several days and being active minimally from the time I joined until recently. My own reputation score has been hampered slightly by one Niche suggestion failing to get community approval. As you can see, there is still six-and-half hours of voting left. But almost all of the votes have been against. In fact, only 9.26% of the votes are in favor. 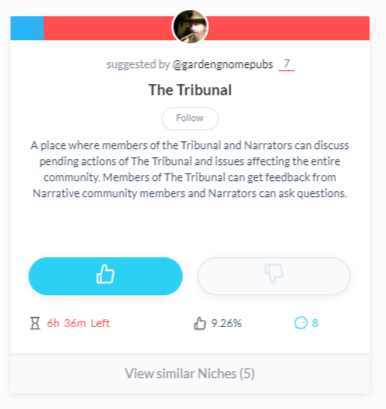 This Niche was suggested several days ago and has been allowed to sit for an extended time because it didn't reach the 20 required votes (for or against) to end the approval process. It now has 24 votes and will clearly not be approved, which will certainly affect my reputation for a short time until the "decay" period resolves. 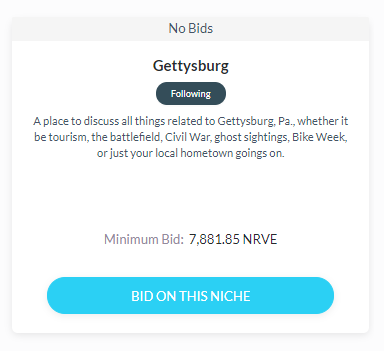 Meanwhile, all of my other Niche suggestions, such as the one that was recently approved and is now at auction, are getting excellent approval ratings. Based on my interactions with other Narrative members this past week and my experience suggesting Niches, I'd say the most important activity for Narrative users right now is suggesting new Niches. However, that will soon change. When the beta launch occurs, I fully expect those who are actively suggesting new Niches daily will spend much of their time creating new content on their personal journals and pushing that content out to the relevant active Niches on the Narrative platform. They may still continue to suggest Niches, but they will begin the practice of creating new content in order to increase their reputations and, of course, use Narrative for its intended purpose. There is just one warning I would issue to new users of Narrative (and I invite you to join as I think it will be a useful place to express yourself). My warning is this: Make sure you understand the platform and its culture before you jump in and start using it. Since so much weight is put on quality and conduct, you want to make sure that you are operating according to all the rules of the playing field and doing things the Narrative way. Having said that, I hope you'll join me on Narrative. If you do and you click this link, I'll earn a few NRVE (Narrative's native cryptocurrency). 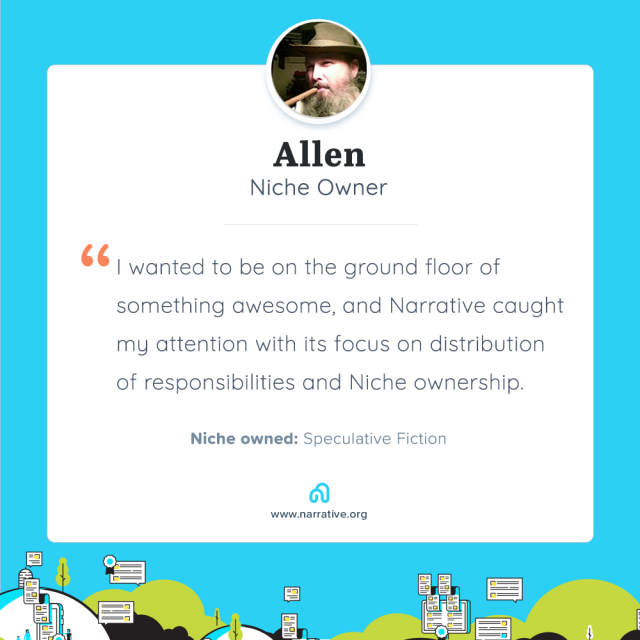 I am the proud owner of the Speculative Fiction Niche on Narrative. All images in this post, with the exception of the Speculative Fiction Niche Owner Card, are screenshots from the Narrative platform. Very comprehensive review of Narrative. I'm signed up for it, but haven't been on it much, because there isn't much to do yet. Thanks for making the comparison with Facebook. I'm hoping it captures some attention away from Facebook. If anything, I'd like to see it become a powerhouse blockchain-based social site. Hope to see you there some day. Very interesting and I have never heard of Narrative! I was once a Facebook user, but I am bothered by all the "negative" things on there, be it advertising or comments... especially comments which seem, if they are of negative connotation, to snowball and become outrageous. For now I will stick to Steemit/Steempeak, but I will definitely be checking out Narrative. Thank you so much for all the information presented here! The only reason I'm still on Facebook is to keep up with family. I check in once a week. Otherwise, it's nothing but a meme factory. And, yes, a lot of negativity. At least you want to post. I'm happy you're here, @wales. I haven't explored Narrative even though I have the account. Thanks for giving so many information for me to digest. As you know, I left Fakebook a long time ago. And in spite of my privacy-centric, anti-social tendencies, I just might make a foray into the Narrative world. Thanks. I've been enjoying my time on Narrative. It took a little bit to used to, but it could very well shape up into something solid. Excellent alternative that you have presented us today. Deverdad I consider it a very valuable tool. I would support it completely. Especially if it helps to reduce the use of facebook. Must confess this is the first time I have come across "Narrative." No doubt, I shall find time to check it out, but I'm increasingly starting to ponder the density of all these newcomers to the social blockchain... Clearly, Steem/Steemit has the "first mover advantage" here... and whereas I can appreciate that it is cool and has a certain appeal to be into something at "ground level," I am starting to worry that there is going to be so much dilution in this market that nobody will ever make it past the "ground floor." I think we are a long way from dilution. But, yes, it can get crowded. Right now, most of these platforms are experimental. Some will be loyal to Steemit, some will be loyal to Minds, and others will be loyal to Narrative or Trybe. A few will jump between them all. Some, probably a large majority, will remain stuck on legacy platforms, at least for the time being. "Dilution" won't happen until Facebook starts losing users to blockchains. That will be a while yet. Howdy sir blockurator! What a fantastic article this is, I didn't even know about Narrative so this was a great introduction! Well done sir. Thanks! I hope to see you there some day. howdy again sir blockurator! Well sir, you might, I'm starting to take a look at other platforms. thank you! Awesome. If you use the link in this post, I'll receive a small referral fee in the native token. Look me up when you get there. I'm @gardengnomepubs. howdy this fine Sunday sir blockurator! thanks for all the helpful information and link! As usual, excellent article. Well written and insights well articulated. I'm mulling at the moment but will be back with questions. Cool. Catch you on the flip side. Congratulations! This post has been upvoted from the communal account, @minnowsupport, by blockurator from the Minnow Support Project. It's a witness project run by aggroed, ausbitbank, teamsteem, someguy123, neoxian, followbtcnews, and netuoso. The goal is to help Steemit grow by supporting Minnows. Please find us at the Peace, Abundance, and Liberty Network (PALnet) Discord Channel. It's a completely public and open space to all members of the Steemit community who voluntarily choose to be there. You just got a 0.88% upvote from SteemPlus!